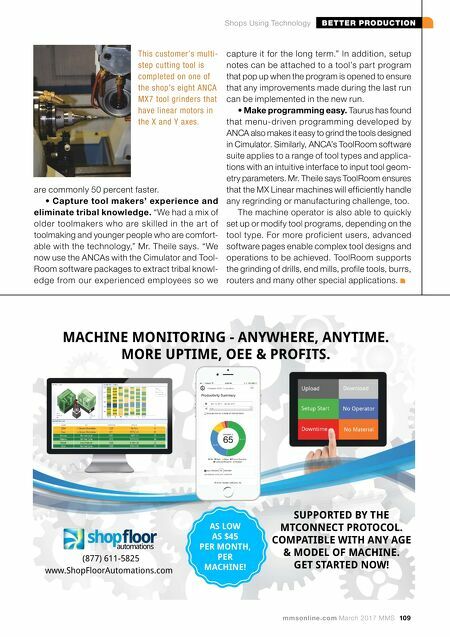 BETTER PRODUCTION Shops Using Technology 108 MMS March 2017 mmsonline.com n Low-to-no dust machining n Large sheet sizes n Custom step tools n Large blocks n 4 lb. to 75 lb. 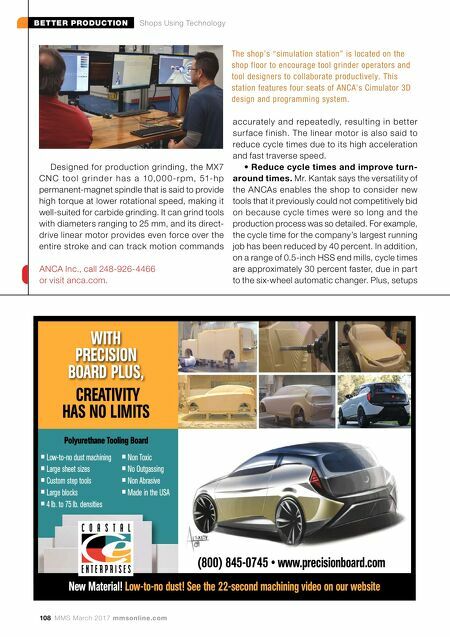 densities CREATIVITY HAS NO LIMITS WITH PRECISION BOARD PLUS, Polyurethane Tooling Board n Non Toxic n No Outgassing n Non Abrasive n Made in the USA (800) 845-0745 • www.precisionboard.com New Material! Low-to-no dust! See the 22-second machining video on our website Designed for production grinding, the MX7 C N C to o l g r i n d e r h a s a 10,0 0 0 - r p m, 51- h p permanent-magnet spindle that is said to provide high torque at lower rotational speed, making it well-suited for carbide grinding. It can grind tools with diameters ranging to 25 mm, and its direct- drive linear motor provides even force over the entire stroke and can track motion commands accurately and repeatedly, resulting in better sur face finish. The linear motor is also said to reduce cycle times due to its high acceleration and fast traverse speed. • Reduce cycle times and improve turn- around times. Mr. Kantak says the versatility of the ANCAs enables the shop to consider new tools that it previously could not competitively bid on because cycle times were so long and the production process was so detailed. For example, the cycle time for the company's largest running job has been reduced by 40 percent. In addition, on a range of 0.5-inch HSS end mills, cycle times are approximately 30 percent faster, due in part to the six-wheel automatic changer. Plus, setups The shop's "simulation station" is located on the shop floor to encourage tool grinder operators and tool designers to collaborate productively. This station features four seats of ANCA's Cimulator 3D design and programming system. ANCA Inc., call 248-926-4466 or visit anca.com.